Buenos Aires: Indian wrestler Simran had to be content with a silver medal after losing in the final of the women’s freestyle 43 kg class at the Youth Olympics here. Simran lost 6-11 to American Emily Shilson late on Saturday night. The Delhi wrestler, who had taken bronze at the Cadet World Championships in 2017, was at a distinct disadvantage in the first period when the American scored heavily to lead by a big margin of 9-2 which ultimately cost the Indian’s ambitions. However, Simran was tactically a better wrestler in the second period when she scored four points against her opponent who managed just two points. 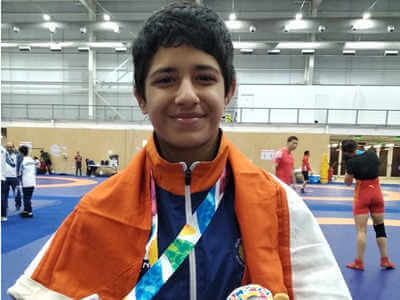 But then Simran’s recovery in the second period was of no avail as Emily, who is a gold medal winner at the Cadet World Championships earlier this year, showed her superiority till the end to deny the Indian any further points. Earlier, the Indian had opened with a win over New Zealander Ella Mae Darry in a Group A classification bout, then followed it up with a convincing win against Maria Leodra of Moldova and finally against Egpyptian Mahmoud Sara Gouda Farouk. Then Simran fought a tough semi-final bout against Group B qualifier Engkhzul Batbaatar of Mangolia before taking on Emily in the gold medal bout. “My tactical error cost me the gold. It was silly of me to give into the deception (the loss of points). But I am happy I could add a silver to the medal tally,” Simran said after the final. “I would like to dedicate this to my father, my family and all those coaches who worked hard to see me where I am,” she added. Simran, who had been a national-level gymnast and had also indulged in badminton before finally taking to wrestling, has to her credit a gold medal from the Asian Cadet held in China in 2016, besides a silver from the Asian Cadet in Bangkok and a bronze at the World Junior, both of which came in 2017. The other Indian in the competition, Mansi in the women’s 57 kg category, finished eighth after losing her classification match to Imbabi Ahmed of Egypt who won a decision by fall. In the past, Pooja Dhanda has taken a silver and Satyawart Kadian a bronze at the 2010 Youth Olympic Games.